Posted in Series	| Tagged Democratic PArty, Geoje, MinJoo Democratic Party, Moon Jae-in was previously the head of the Democratic Party., National Assembly, President, President Moon was elected following Park Geun-Hye's impeachment., South Gyeongsang Province, theminjoo.kr, 국회, 대통령, 더불어, 더불어민주당, 문 대통령은 박근혜 대통령의 탄핵 다음에 선출됐어요., 문재인은 이전에 더불어민주당의 총재였어요. 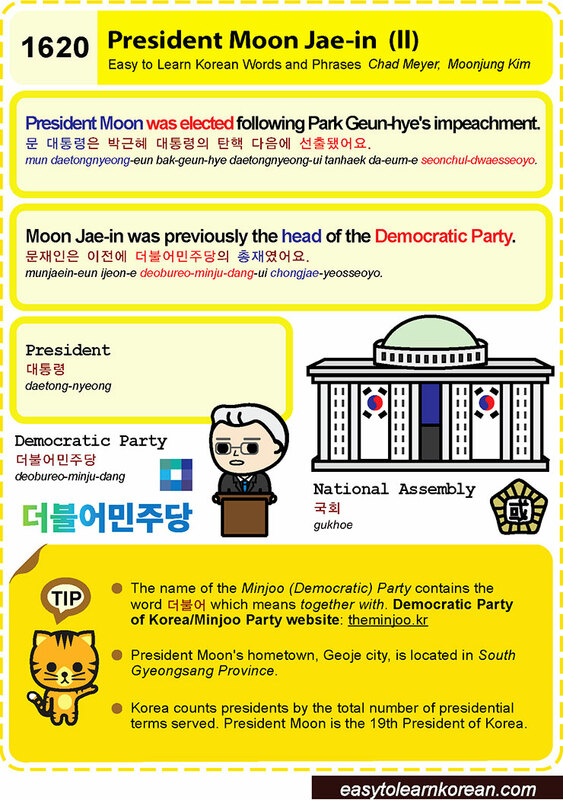 Easy to Learn Korean 1542 – Presidential impeachment (part two). Posted in Series	| Tagged Democratic PArty, Gwanghwamun Plaza, impeachment, Many people in Korea want the President to resign., Moon Jae-In, National Assembly, Park Geun-Hye, People's Party, President Park, Presidential impeachment, Saenuri Party, She did not admit to any wrongdoing., She will not resign unless ordered to by the National Assembly., The Korean President has immunity from prosecution during their term., 광화문광장, 국민의당, 국회, 그녀는 국회에서 명령하지 않는 한 사임하지 않을 거예요., 그녀는 잘못된 행동을 인정하지 않아요., 민주당, 새누리당, 한국 대통령은 재임 중 기소에 면책권을 갖아요., 한국의 많은 사람들은 대통령이 사퇴하기를 원해요. 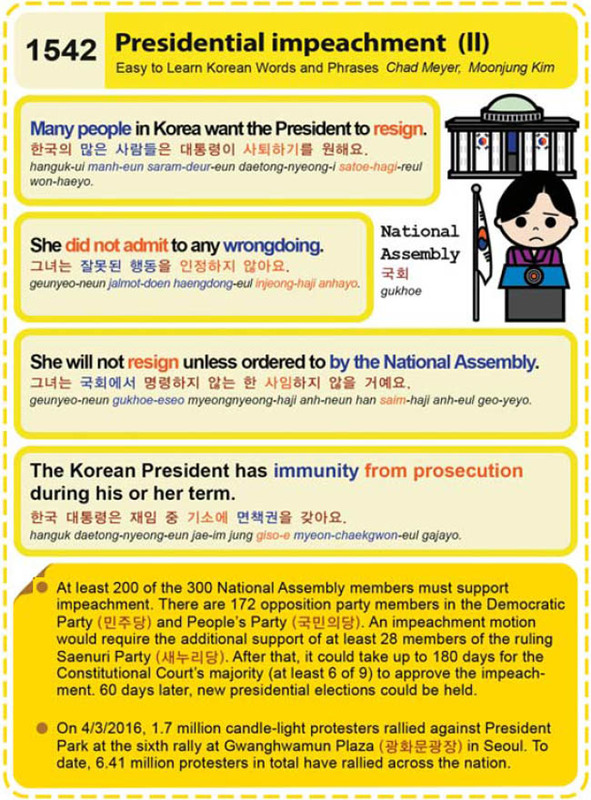 Easy to Learn Korean 1541 – Presidential impeachment. Easy to Learn Korean 772-773 – ex-President Park Geun-Hye. Korea’s new President, Park Geun-Hye, had her inauguration today at the National Assembly building on Seoul’s Yeouido (island) alongside 77,000 selected citizens and politicians. The post-inaugural parade took her to Gwanghwmun Plaza in northern Seoul and finally to the nearby capitol building, Cheong Wa Dae. This is a return to the Blue House for Park since she already lived there for 15 years as the daughter of the late President Chung-Hee. She was also promoted to the post of First Lady for five years, following the assassination of her mother in 1974. 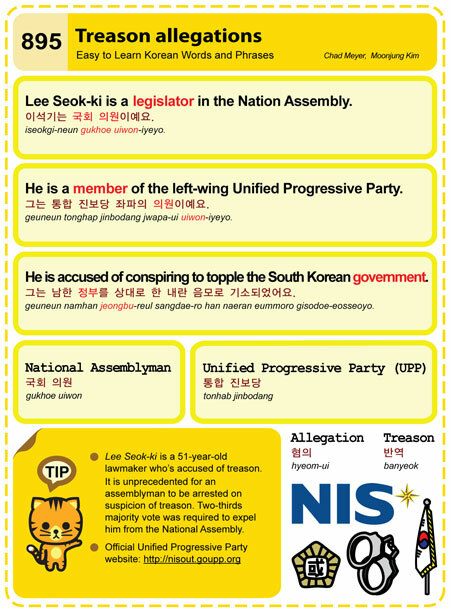 Interesting fact: President Park holds a bachelor degree in Electrical Engineering (1974) and can speak five languages.